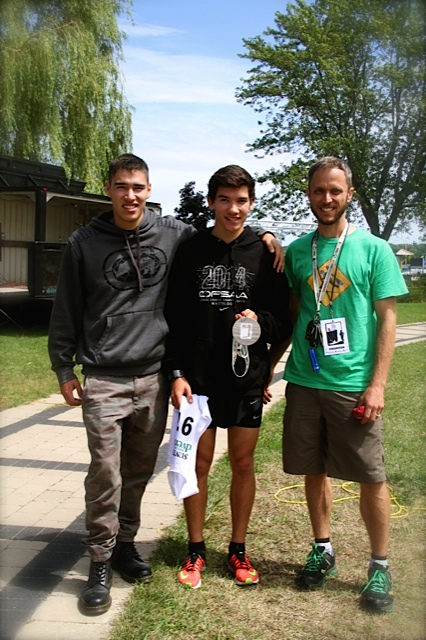 Saturday’s Bruce Peninsula Multisport Race (BPMR) is being called a great success. It raised over $5,000 for outdoor sport on the Bruce. Here are 5 interesting storylines from the day. Siblings 18-year old Steven Nadjiwon and 16-year old Rose Nadjiwon finished first overall in the Suntrail – Source for Adventure Course for their respective Open Male and Open Female divisions. These finishes mark the first time a duathlon racer has beaten the traditional paddle-bike-run racers. Race organizers and spectators were blown away to see the two local duathletes cross the finish line so quickly! “I’m not surprised to see Steven & Rose do so well, but I had no idea anyone could run 5km of some of the roughest trail in Ontario faster than our very skilled fastest paddlers could paddle on a calm water day,” says Grigg. Although it’s not entirely that easy for the paddler (who also has to beach their boat, stow their gear and run up a hill in that time) there is something to be amazed about with how quickly the Nadjiwon siblings can race. 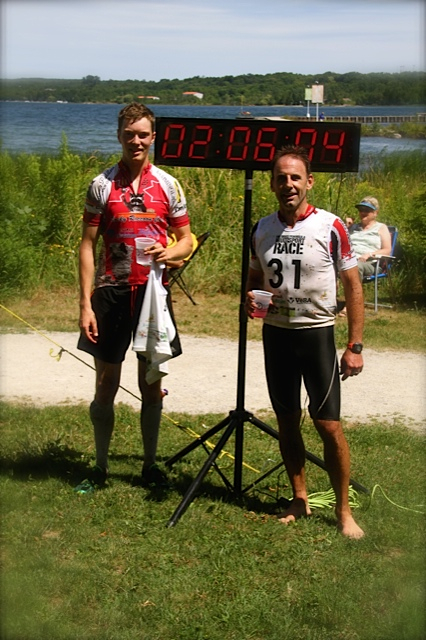 Mark Shouldice of Shallow Lake was the fastest paddle-bike-run solo racer, besting return racer Michael Patrella by 3 minutes and recording a time of 1:44:03. Paul St. Pierre of Waterdown, Ontario won the Masters Men over Ken Whatmough of Georgetown, Ontario. After Rose Nadjiwon’s overall women’s victory came the podium of Claudette McKnight in 1st, Una Hall in 2nd and Hannah Sarnovsky in 3rd in the woman’s Suntrail course. McKnight’s victory is her second straight, and Hall’s accomplishment comes after becoming a new mother earlier this year. Darcy Yee of Toronto won the women’s masters in front of Caroline Wolf & Katherine Schultz. This year’s BPMR showcased the largest armada of canoe teams, with a whopping 20 canoes side by side at the start line Saturday. Men’s canoe team “Quick Laces” came home the fastest at 2 hours 12 minutes, followed by coed team division winner “Til Death Do Us Part” in 2 hours 18 minutes. The fastest women’s canoe team was “Myers Witteveen” with a time of 2 hours 36 minutes and 12 seconds. Rain poured down on the Buff Long Course racers during the morning paddling stage. Conditions in Georgian Bay were otherwise fine with no lightning or winds to worry the organizers. 2014 Long Course champ Peter Beisel of Owen Sound was at the front of the pack most of the day, pulling ahead to 1st place mid-way through the race. He was passed by William (Bill) Logie of Toronto in the 2nd bike stage. Even though Beisel was within sight back at the last TA, Logie’s last 5km run was faster and thus he went on to win the 107km race by approximately 8 minutes. Logie also wins a round-trip airfare on Air North to Whitehorse or Yellowknife. Second place in the open mens division went to Alex Kelly from London & 3rd went to Michael Schar of Baltimore, Maryland. In the women’s race, the winner of the Air North voucher was Shannon Miller of Thornbury, Ontario. She has announced herself as a force to be reckoned with in the sport. Miller was 9 min 30sec faster than Stina Bridgeman from Canandaigua, New York who placed 2nd and Glenna Fraumeni of Toronto was only 3 minutes further behind. The mens masters Buff Long Course category was competitive again this year with 11 men over the age of 45. Bill Logie was one of them, Steven Forrest from Carlisle finished in 2nd and Ken Skinner from Toronto in 3rd. Katherine James was the only masters woman and finished in just over 10 hours. The fastest in the paddling stage was Guelph’s Peter Dobos whose day ended after an injury in the run stage. Birch Behmann from Lions Head walked away with the Devinci Jackson mountain bike prize, courtesy of Bikeface Cycling in Owen Sound & Devinci of Chicoutimi, Quebec. Four racers at this year’s race were being filmed for the TV series Boundless. Boundless is currently filming season 3 for the Esquire Network, and the series chose the BPMR as it’s first stop in a Canadian location. Canadian ultra-racers Simon Donato and Paul “Turbo” Trebilcock added new American cast members – ultra-running legend Rory Bosio and Spartan racing world-champion Hunter McIntyre – to their own backyard to experience the beauty of the area, and be challenged to this great one-day adventure. The Boundless team of Turbo & Hunter finished as the fastest tandem team in the Buff Long Course, and won the Via Rail prize of travel for 2 anywhere in the Windsor to Quebec corridor. Ripkin AR and Flummoxed finished 2nd and 3rd in the male tandem category. The Boundless team of Simon & Rory were at the top of the coed tandem team podium. Long Sault Long Shots and Team Schwass were 2nd and 3rd there respectively. The relay division was won by Armed & Dangerous, captained by Shane Jolley who owns Alternative Wheels in Owen Sound. Rock & Road Cycle from Burlington and Team Baker/Wood, who ended up at the top of the coed podium, were close behind. 125 volunteers put in over 200 volunteer shifts at the Bruce Peninsula Multisport Race this past weekend to make the event happen. Michele Mannerow, Karla Lang, Jill Nechala, Mark Shouldice, Tanya Fish & Jason Burrows have completed a race in all 5 years of the BPMR. Approximately 50 people have been a part of the event (involved either as a racer or volunteer) in all 5 years. All 50 were given a special “golden Buff®”, not available for purchase, to commemorate their accomplishment and to celebrate the 5th annual race. The race has a long-time relationship with Buff Canada and together they produce a custom Buff® for the event every year. In past, race imagery has been used, the Bruce Tartan has been featured, and this year the relationship with the Chippewas of Nawash Unceded First Nation was commemorated with a custom design inspired by a family quilt. This past weekend all volunteers also received the gift, helping to solidify the relationship between the event and its key helpers. “What a great way to recognize the efforts of individuals whom have donated their time to the event and it’s success,” writes Owen Johnston, Fire Chief for the Chippewas of Nawash Fire & Emergency Services, whose family owns the quilt. Next year’s BPMR will be held on August 13, 2016 and will be on sale soon. I believe the 3rd place finisher of the long course should be Alex Kelly.